My Weird School Game is both educational and entertaining. Players will be challenged to make a five card sentence while trying to score the most points and while making sure the first two cards rhyme. This game is fun for all ages that can read. You'll be amazed at the crazy sentences you'll be putting together and having a good time doing it. 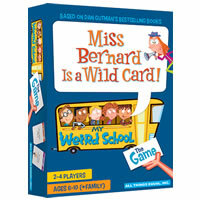 My Weird School Game is indeed a weird school game that is fun for all ages. Give this game a try today. Gain the most pionts to win this game. Included are 4 boards, a score pad, a pencil, 110 playing cards and the official My Weird School Game game rules and instructions. Please keep in mind that the official My Weird School Game childrens rules and instructions could be different depending on the game version you have. The rules below are some of the exact directions on how to play My Weird School Game. Share with us your comments, funny stories, tips, advice, strategies, creative ways to play, questions about how to play, problems with the rules or anything you want about My Weird School Game. All submissions will be reviewed within 24 hours. Click here to add your My Weird School Game comments.